Erlanger Bledsoe Hospital, Pikeville, TN. Is the tri-state region's only Level I Trauma Center, providing the highest level of trauma care for adults. Is part of the Vanderbilt Health Affiliated Network that includes 56 hospitals and 4,000 participating physicians and clinicians. Has six LIFE FORCE air ambulances in its fleet, three based in Tennessee, two in North Georgia, and one in North Carolina. Is home to Children's Hospital at Erlanger which includes the region's only Level IV Neonatal Intensive Care Unit, as well as a pediatric trauma team, Emergency Center, and Pediatric Intensive Care Unit. Serves as the region's only academic teaching hospital, affiliated with the University of Tennessee College of Medicine Chattanooga Campus. Houses the Erlanger Southeast Regional Stroke Center, recognized for its world-class stroke and neurosciences program. We compassionately care for people. 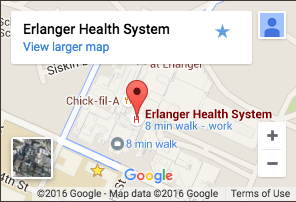 Erlanger is a nationally-acclaimed health system anchored by a leading academic medical center. As such we will deliver the highest quality, to diverse populations, at the lowest cost, through personalized patient experiences across all patient access points. Through innovation and growth, we will sustain our success and spark economic development across the Chattanooga region. Excellence - We distinguish ourselves and the services we provide by our commitment to excellence, demonstrating our results in measurable ways. Respect - We pay attention to others, listening carefully, and responding in ways that demonstrate our understanding and concern. Leadership - We differentiate ourselves by our actions, earning respect from those we lead through innovation and performance. Accountability - We are responsible for our words and our actions. We strive to fulfill all of our promises and to meet the expectations of those who trust us for their care. Nurturing - We encourage growth and development for our staff, students, faculty and everyone we serve. Generosity - We are giving people. We give our time, talent and resources to benefit others. Ethics - We earn the trust by holding ourselves to the highest standards of integrity and professional conduct. Recognition - We value achievement and acknowledge and celebrate the accomplishments of our team and recognize the contributions of those who support our mission.